The Randall Museum in San Francisco hosts a large HO-scale model train layout. Created by the Golden Gate Model Railroad Club starting in 1961, the layout was donated to the Museum in 2015. Since then I have started automatizing trains running on the layout. I am also the de-facto layout maintainer. 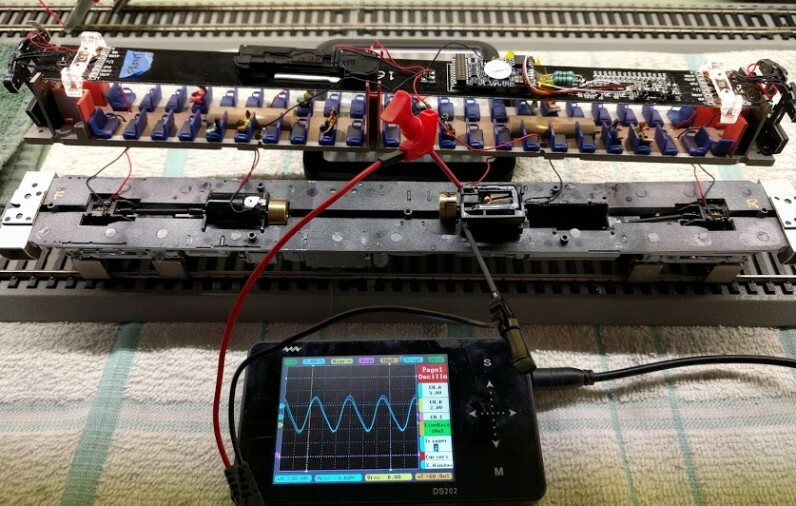 This blog describes various updates on the Randall project and I maintain a separate blog for all my electronics not directly related to Randall. You’d be right to ask “what the heck am I looking at here?!!”. Very fair to ask. You are looking at a Rapido SP-10 RDC disassembled, with the motors being in the process of being replaced. Let make me this clear: if your Rapido RDC stops running, save yourself some trouble. Contact Rapido’s support, and ask them to fix it for you. You’ll save yourself a lot of trouble. Let me make things clear upfront: I love Rapido’s design for the RDC, and I really really enjoyed interacting with Michael from their support. I’m impressed by Rapido. Period. What I was less than impressed by is whoever manufacturer who provided these motors to Rapido. Apparently all the first batch of Rapido RDCs started failing with the same issue -- motors contacts would oxidize and motors would stop working. Unfortunately not an issue of “if” but “when”. The RDC has 2 motors, one per truck. In our case, the Randall RDC had one that stopped and one that was sort of working but very weak. Opening the RDC to access the motors is not too bad yet it’s not trivial either. Rapido’s design makes that simple (but time consuming and tricky) to assemble and disassemble -- and more important, to put back together at the end (with a lot of patience). I had already opened the RDC to add a current keeper, and I wanted to open it again to put passengers in it. This I opened it again and decided to “fix” the motors. Nothing that a small bit of CRC 2-26 Electrical Contact Cleaner can fix, right? Well that didn’t do it. After realizing that was not cutting it, I contacted the support at Rapido and Michael sent me new motors, as well as new motor mounts. He also gave me extras, and I’m glad he did as the first 2 new motors I tried didn’t even work properly -- one had a bad contact in the soldering pin and the other didn’t run smoothly at all. OK let me rephrase that last part. The 2nd motor I tried seemed to work, so I mounted it, started assembling the chassis and before putting the shell back I tried it again and one truck was not running. Sigh. So back at dismantling things. And then the motor works, wait what? Grrr. I suspected an issue with a wire contact, thus the picture above trying to check the contact at the motor under various conditions. Turns out the flywheel on that second motor was 1 mm farther than on the other ones and was rubbing against the case once assembled, but seemed fine when running it unscrewed. I don’t have the tool needed to properly push in the flywheel. And these motors were in a sealed plastic bags, so likely came as-is from their motor’s manufacturer factory. Eventually out of 4 motors, I had 2 working as intended and in the end was able to rebuild the RDC. Oh one tip I wish somebody had told me before hand: the motors have a + side and - side. That is obvious, and I was expecting that. But both on original motors and the new motors, I couldn’t find any sign. Turns out there is a very very tiny “+” engraved on the flywheel-side of the motor. It’s really really tiny and I never noticed it till the 4th motor so I just had to solder the first motors one way, trying them and reverse as needed. Overall I spent about 6~8 hours on that -- I know I take things slowly, yet still it was way more annoying than I expected. I’ll stick the whole experience under the “worth going through once, did learn something out of it” category. Bottom line, if your RDC stops running, contact support at Rapido. Don’t just send it back, contact support first and talk to them. And yeah sometimes they are a bit busy and don’t reply right away. Ask again nicely. Think it’s Michael on the other side of the line and he really tries his best. If you’re not sure on doing the motor swap yourself, don’t hesitate and ask them to fix it for you. Sure you’ll have to pay for shipping but it’s worth it. As for Randall, as soon as I get a chance to go back to the museum next month, I’ll set it up on the automation.